Optimum use of natural light, thermal performance and the colour grey were the requirements on a high specification project in the SE for frameXpress. 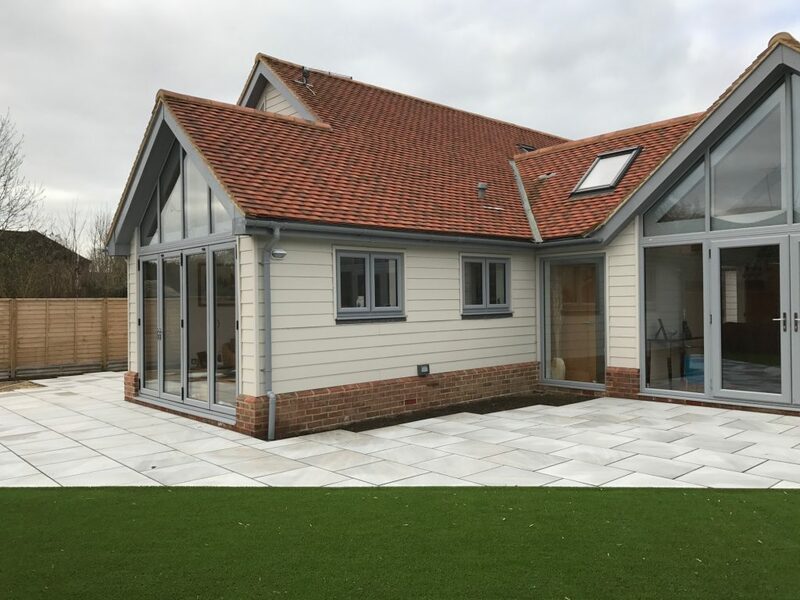 The company’s range leant itself perfectly for this property with shaped format windows, bifold doors, French and Composite doors as well as skylights all manufactured by the leading trade fabricator. The frameXpress sales team has noticed how colour is being used more frequently to create stunning overall finishes that are helping customers to generate greater profit margins. Equally with textures now also becoming an important consideration for designers, use of colour is becoming even more important on modern projects. Exciting designs are becoming increasingly popular where modern concepts are combined with an overall traditional feel which creates exceptionally striking finishes. This was most recently demonstrated in Hertfordshire where the final phase of a new build project was recently completed. Shaped formats were a focal feature on the private home, which were installed in order to maximise upon the use of natural light. The use of colour here too was integral to the architect’s vision with the desire to create a modern masterpiece that blended the best in high performance products with striking design. Designs and performance in window and door products have progressed considerably thanks to innovation across the industry, with high performance glasses also playing their part in providing homeowners with substantial energy efficiency and security benefits. Consumers are gradually accepting that changes for the better do not necessarily require moving home and this creates far more business opportunities for installers than ever before. New coloured foils give homeowners more possibilities to create bigger and more beautiful installations by incorporating products that complement each other and add a great deal of value to their homes. Aesthetics and performance are now playing a vital role in contemporary design projects with people realising that they can reflect a lifestyle choice and enjoy it. Also, the introduction of glass products such as Pilkington’s Activ Blue glass or the BioClean Cool-lite from Saint Gobain’ revolutionised a previously stagnating market. As solar control glasses allow homeowners to personalise their homes as never before, there are now a vast number of options available which are helping frameXpress customers to grow their business with glass tints and colour foils combining to create huge potential. Product diversification is imperative for any business and whilst price differences may have been vast initially, costs for coloured foils are now much more competitive. As product design continues to improve, so can the options increase for installers when approaching the consumer. Over the last 10 years there have been great innovations that have been huge selling points for installers, and management at FrameXpress believes there is still huge potential for the industry if installers take full advantage of the products that are now available to them. “The consumer is still reticent to make quick decisions when making financial commitments in the home, however this is slowly but surely changing for the better. “Today, performance values are improving and the colour choices available are increasing. Likewise, triple glazing is growing in popularity as the values offer huge advantages in respect of sound insulation and reducing energy costs. FrameXpress Ltd is a leading trade fabricator of windows, doors and conservatories as well as bifold and Composite doors. For more information visit: www.frameXpress.co.uk.